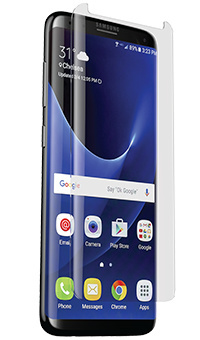 Designed for the Galaxy S8+'s curved display, the Zagg Glass Contour offers protection with a precise fit. The oil-resistant technology keeps your screen free from smudges. Made from high-quality tempered glass, the Zagg Glass Contour protects your screen against drops, scratches and other types of damage. And it's covered by a limited lifetime warranty for as long as you own your Galaxy S8+. The Glass Contour ensures every pixel on your Galaxy S8+ is preserved so you can watch your favourite shows and movies in high definition. And you can still use your touchscreen easily and comfortably with its remarkable touch sensitivity. The Glass Contour is easy to apply, with long-lasting oil-resistant technology that prevents fingerprints and smudges. So you can clean your Galaxy S8+ effortlessly - and less often. Custom built for the Galaxy S8+, the Zagg Glass Contour offers edge-to-edge protection for your phone's curved screen while remaining slim and light - so your phone will still fit in most phone cases.